This chapter provides a very brief description of Squirrelmail, the webmail application that is used in ServerAtSchool. This chapter is illustrated using the mailbox of Helen Parkhurst, teacher at the Exemplum Primary School. See section 2. The Exemplum Primary School in chapter II. ServerAtSchool User Manual Overview for more information. Helen needs this information to authenticate herself when she wants to access her mailbox with Squirrelmail. Access to webmail on the ServerAtSchool server can be limited. The local systems administrator or the ICT coordinator is able to limit webmail access for every individual user. The possible choices are listed below. Webmail is not accessible at all. This option is often used for individual pupils at school. 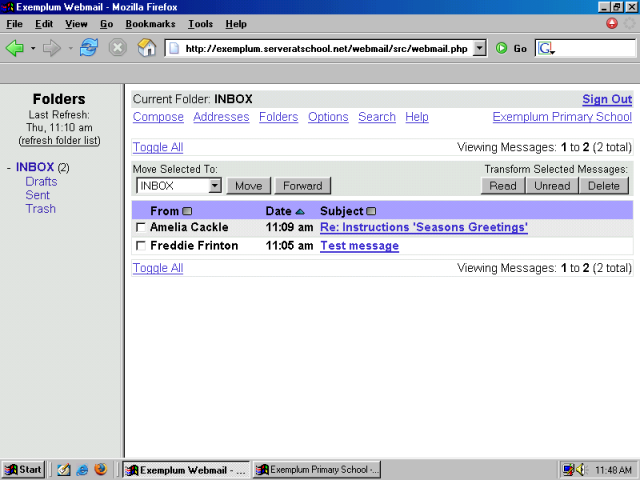 Webmail can only be used from a workstation that is connected to the LAN (Local Area Network) at school. This option is sometimes used to grant nests (grades, classes) access to webmail in a controlled environment. This prevents abuse of the school e-mail facility by pupils from locations outside the school. Webmail access is limited to one or more IP-addresses. This feature can be very useful to grant access to webmail to an individual user from a specific location outside the school. For instance that one pupil in grade 8 who is ill and has to stay at home for 3 months. By granting access to webmail for this pupil's home computer, she can keep in touch with school. If she also is allowed to work with school files and documents at home (see XII. Teleworking with WinSCP) sha can almost fully participate. Webmail access allowed from anywhere, even from an Internet cafe in Amsterdam. This type of access is often granted to staff members. Please ask your local systems administrator or ICT coordinator for full details of your own access privileges. Depending on the way the school's website is configured, a special webmail login page may have been added to the website, as illustrated below. NOTICE: It is possible that another webmail login page is available, at another URL, e.g. 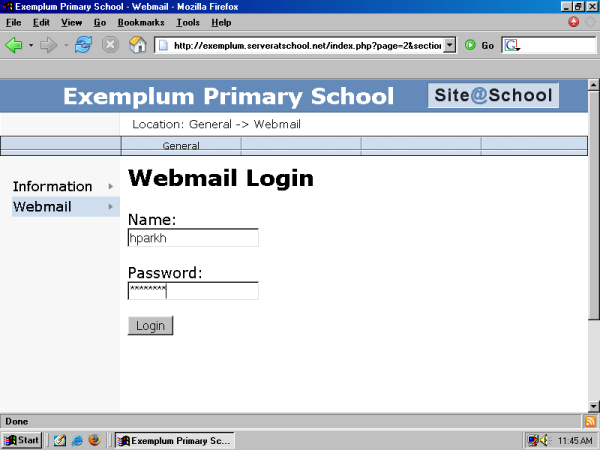 http://www.exemplum.serveratschool.net/webmail/ or perhaps http://webmail.exemplum.serveratschool.net. Ask your local systems administrator or ICT coordinator for details. Note that Helen has entered her userid (here: 'hparkh') and her password (here: 'wWITa4ye') into the dialogue. The password is shown as a series of asterisks. This is a security measure. After pressing the [Logon] button, the following is displayed. This is Helen's mailbox. At the moment her mailbox contains two e-mail messages, one sent by Freddie Frinton (the local systems administrator) and one by Amelia Cackle (the school's head mistress). By clicking on the Subject-line of a message (e.g. 'Re: Instructions 'Seasons Greetings'' or 'Test message'), the message is displayed. Once it is displayed, it can be read, replied to, deleted, forwarded, etc. By clicking on the link 'Compose', a new messages can be written. Once a message is written in the compose window, it can be sent, saved or discarded. By clicking on the link 'Options' you can configure Squirrelmail settings such as the sender name and address (e.g. 'Helen Parkhurst', helen.parkhurst@exemplum.serveratschool.net). You can return to the list of received messages by clicking on the linke 'INBOX' in the left hand pane. This always brings you back to the list of received messages. If you click on the link 'Sign Out' in the top right corner, the webmail application program will close and you will be taken back to the school's website, e.g. back to the login page that was displayed in section 2.2 Logging in above. Squirrelmail has an excellent online help function. It can be accessed by clicking on the 'Help' link available on nearly every Squirrelmail dialogue screen. Another good source of documentation is the project's website at www.squirrelmail.org and more specifically the online Squirrelmail manual in the form of a wiki at www.squirrelmail.org/wiki/UserManual. Furthermore many, many introductions to Squirrelmail have already been written. You can use your favourite Internet search engine to find a plethora of information, e.g. using the keywords 'squirrelmail', 'introduction' and 'school'.